Difficult Market Spooks Investors – Technical Traders Ltd.
We have been following the news cycles for many months regarding the prognosticators that believe “the sky is falling” in the global markets and we find it interesting to see how quickly the bulls turn to bears when the market rotates 4~5% or more. The reality is that in traditional market price rotation, a 3~5% market price rotation is a very healthy component of price advance or price declines. 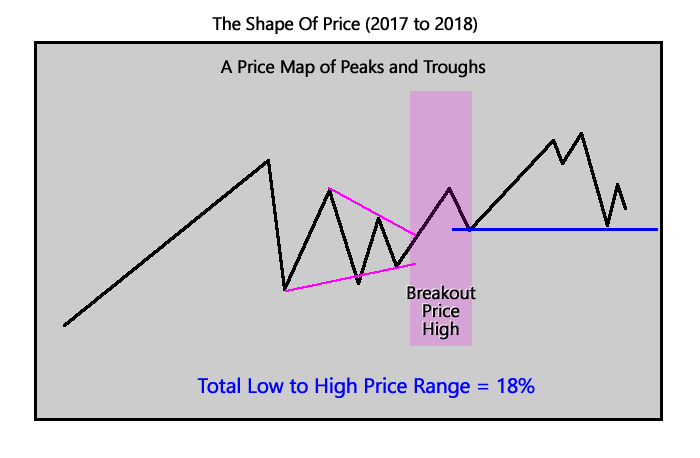 When we consider the price swings within the SPY from early 2017 till now, we are looking at a total of at least 18% total Low to High price swings with a number of large 6~8% price rotations and many 2~4% smaller price rotations. The natural rotation of price, as Fibonacci price theory teaches, is that price will always attempt to establish a new higher high or lower low in the process of extended trends. This means that price is always attempting to find and establish some new price high or low by rotating/trending within existing/past high or low price levels. May 2018 price pushed above the most recent price high channels and established a NEW Breakout Price High. This established the price trend as Bullish again and began a normal type of price rotation higher. In the process, it established a number of price lows that we can use as reference points for prior support and for our analysis of Fibonacci Price Theory as it relates to this current price move lower. Getting to the current price charts and trying to make sense of the Fibonacci Price Theory example, above, is something we all need to pay attention to. Understanding price theory is only one component of the overall analysis process. There are many aspects to technical analysis and one of the most important is to understand how price operate within a global environment – the global economy. Price becomes a variant of many aspects of the global economic environment and is continually related to various external factors of the global economy and the perceptions of traders/investors. Putting it in simple terms, price becomes a factor of “whatever price investors are willing to pay for the safety and security of any type of various investment instruments OR whatever price investors are willing to sell at for the safety and security of exiting any type of various investment instruments”. Keeping all of this in mind, remember that the US Equity market is, in our opinion, the leading capital market and investment destination on the planet right now. There is no other source as big, as varied, as capable and as liquid as the US Equities and Capital markets. This Weekly SPY chart highlights a few key elements of the current price swings and one key element which is the Standard Deviation channels. Within this chart, we’ve drawn two Standard Deviation Channels that originate on November 8, 2016, and continue through today – a 2.0 StdDev channel and a 3.0 StdDev channel. The purpose of showing you these channel ranges and levels is to more clearly illustrate the type and level of current price rotation that we are seeing in the US Markets. The current price rotation originated near the top of the 2.0 StdDev channel and rotated to near the low of the 2.0 StdDev channel. In relative terms, this is nothing more than a common price rotation that has yet to extend beyond normal rotational channels. Support from the February 2018 price rotation and what we call the “Price Support Zone” are still intact and active as core elements of current price support. In other words, the price would have to fall below $259.00 before we would be concerned with any massive Fibonacci Price Theory price reversal. 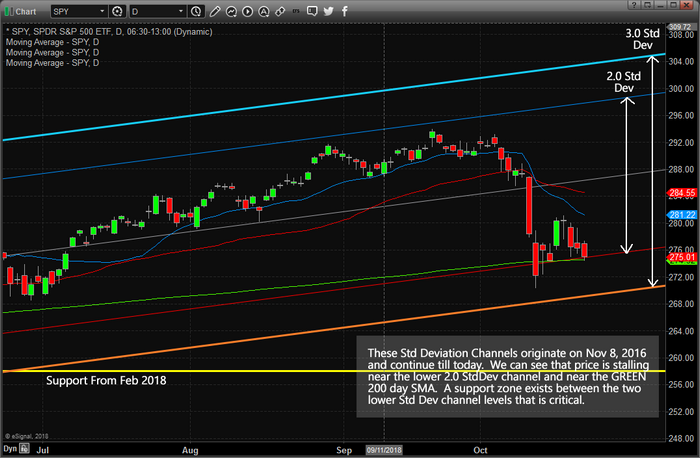 This SPY Daily chart shows the same Standard Deviation channels and the Support from Feb 2018 as key elements of this chart. The importance of this chart is to understand that the current lows, near $270 (or the lower 3.0 StdDev channel) are the low price level that acts as massive support for this potential bottom. Should price break below this level, then the $259 level becomes our next target and we could assume price has entered a short-term bearish mode. 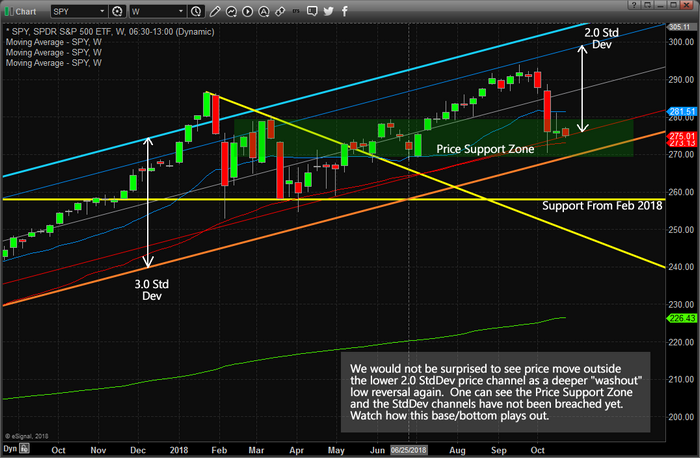 Right now, we believe the bearish price trend will end near this support level and will soon begin an upward price move very similar to what happened after the February 2018 lows were established. Volatility is high right now and the price will rotate to establish new high and low price levels just like we saw on the first chart of this article. Eventually, price will consolidate and break to one side or the other. Our modeling systems suggest the breakout move will be to the upside again. Playing this move with skill and understanding of price theory and dynamics can allow you to identify and execute incredibly profitable trades throughout this price rotation. Don’t be fooled by the news cycle content. Expect price to rotate within a 3~4% range for the next few weeks while volatility decreases and price range decreases. Near November 8 ~ 12, we expect an ultimate price bottom that will likely be the start of a new Bullish price trend and result in a new Breakout move to the upside. Nothing, so far, is unusual in terms of price rotation. Be smart and take advantage of these price setups while you can. If you want to learn about what we do and how we help our members find greater success, please visit www.TheTechnicalTraders.com to learn more. We pride ourselves on being ahead of these market moves and helping our members find and execute trades for greater success. We called this downside market move over 3 weeks before it happened and you can read how we did it by visiting www.TheTechnicalTraders.com/FreeResearch/. Please take a minute to see if our services and tools can help you create greater success in 2019 and beyond.